Overindebtedness in European Consumer Law - iff - institut für finanzdienstleistungen e.V. 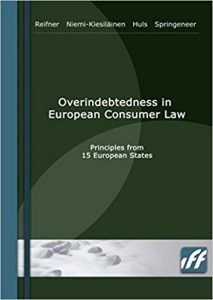 This book is drawn from a report prepared for the European Commission (DG Health and Consumer Protection) under the title “Consumer Overindebtedness and Consumer Law in the European Union” (Contract Reference No. B5-1000/02/000353) in September 2003. It highlights the wealth of legal instruments which have been developed historically at national level to cope with consumer overindebtedness, following the spread of consumer credit and debt and the development of what is now called the credit society. While the discussion of addressing overindebtedness was confined to the narrow question of personal bankruptcy law, the authors go further and show that in the tradition of legal help for overcommitted debtors, intervention begins at a much earlier stage, when prevention was still possible..